What were the highlights of this year's RSA Conference in San Francisco? Discover the major security developments that happened in the past year and the biggest topics discussed during RSAC. This is an interactive session and the audience is encouraged to ask questions during this live webcast. Join us for this webinar that will present an advanced data science approach to detecting anomalous behavior in complex systems like the typical corporate network that your IT Security team is trying to defend. Generalized anomaly detectors, without tuning for a specific use case, almost always result in high false alarm rates that lead to analyst alert fatigue and a detector which is effectively useless. In this session, Brenden Bishop, Data Scientist at the Columbus Collaboratory, will present an open source tool and best practices for building specific, repeatable, and scalable models for hunting your network’s anomalies. Through iteration and collaboration, defenders can hone in on interesting anomalies with increasing efficiency. Join us for this webinar that will recommend how to deal with your “big data” problem when dealing with the massive volume of raw, unprocessed data points from your network security sensors. Hint: don’t start with the data and attempt to drill down to the problem. Instead, as Slava Nitikin, Data Scientist from the Columbus Collaboratory will explain, you must start by the defining problem, building a threat model, and then focusing on the corresponding signals in your sensor data. We will walk through the use case for an Active Directory password spraying attack to demonstrate how to define and apply appropriate filters to your security data for faster detection, more accurate threat scoring and more effective security overall. Start the new year on the right foot by investing in yourself and improving your leadership skills. Join Glenn Richardson, coach and executive consultant, in this webinar that will explore the principles of leadership. We will review practical tips, supported by real-world examples, from an experienced, successful leader who specializes in coaching and developing new and emerging leaders. Gain confidence in your ability to learn and lead, and, if you’re already in a leadership role or approaching a new position with leadership expectations - congratulations! Join us on this webinar to develop a plan for continue learning, improvement and career advancement. Join Interfocus and Cylance for this webinar outlining the workplace productivity gains that your business can realize through an integrated and unified platform delivering both IT asset management and endpoint security. Most IT teams today suffer from "alert fatigue" from the growing number of devices on their network, and spend on average 5-13 hours a week cleaning up compromised endpoints. Scott Scheferman from Cylance and Masataka Hashiguchi from Interfocus will demonstrate how automation and prevention is worth a pound of cure on your endpoints. Digital identity authentication can be challenging to do effectively. Join us to learn about the evolution of biometrics technologies, from those that determine who you ARE in the digital realm, to behavioral biometrics that determine your identity based upon what you DO and how you do it. Ehab Samy, Vice President of Product Management for Plurilock, will map which digital identity management mechanisms are best suited for particular environments including law enforcement, airport security, health care, and the workplace. Join us at our next Career Conversations session. We'll discuss topics such as: what made them decide on IT or Cyber Security, what were some of their work/life challenges, and what skills and education do they see as essential to success? Kristin was elected to serve as a Washtenaw County Commissioner in 2008 and supported the U.S. Department of Homeland Security in growing cybersecurity outreach to state and local government officials. After elected office, she worked at the Center for Internet Security, focusing on connecting state and local governments to federal services and technology needed to improve cyber security. As Director of Government Affairs at the National Cyber Security Alliance (NCSA), Kristin worked with Google, FTC, FBI, SBA, DHS, NIST, congressional leaders and other key stakeholders across the country to educate consumers and businesses how to protect sensitive data. As a thought leader, Kristin has been seen on the C-SPAN Network, local news outlets and called on by technology publications like SC Magazine and Government Technology to share best practices for online safety; being named an SC Media “Women in IT Security Influencer” in 2017. In 2017, Kristin was chosen for the 3rd cohort in the Presidential Leadership Scholars program which is a partnership between the presidential centers of George W. Bush, William J. Clinton, George H.W. Bush, and Lyndon B. Johnson to bring together a select group of leaders who share a desire to create positive change across our Nation. To address the needs of cybercrime victims, Kristin recently founded the nonprofit Cybercrime Support Network to connect victims with federal, state and local resources in a coordinated manner. As a woman entrepreneur, you know firsthand how challenging it can be to get venture funding. Finding the right investors and other sources of capital to get your idea off the ground can be difficult. There are ways to get the funding you need to get your business moving! Please join Jessica Gulick, Owner of Katzcy Consulting, and Gail Ball, Managing Partner of Chestnut Street Ventures, as they share how to navigate the funding challenge and match investors to the needs of your growing technology firm. This 30-minute webinar gives you keen insight and tactics to gain capital, increase funding success and launch your business. Whether you are an experienced professional or just contemplating a future in Cyber Security, WSC's Career Conversations allows you to have a conversation with women making a difference. Join us and share in Career Conversations with successful women in cyber security! Sandra Larson is a Senior Director of Intelligence for LookingGlass Cyber Solutions, a cybersecurity company specializing in physical, cyber, and brand risks for small business, global enterprises and government agencies. Sandra has been with LookingGlass for almost ten years, and manages the client relationships for LookingGlass’ clientele in the food and agribusiness, pharmaceutical, retail, and technology industries. Previously, Sandra received her Master of Science in Applied Intelligence from Mercyhurst University. Cybersecurity is one of the fastest growing technology market areas. Women-owned technology companies are right in the midst of cybersecurity innovation by delivering products and solutions that protect consumers and businesses from ever-changing threats. Are you looking to help one of these companies grow by investing in their solutions? Perhaps you want to get in early and be a part of their mission to protect and prevent? If you answered yes, please join Jessica Gulick, Owner of Katzcy Consulting, and Gail Ball, Managing Partner of Chestnut Street Ventures, in a 30-minute webinar as they share their insights on identifying and investing in these exciting and fast-growing women-owned firms. 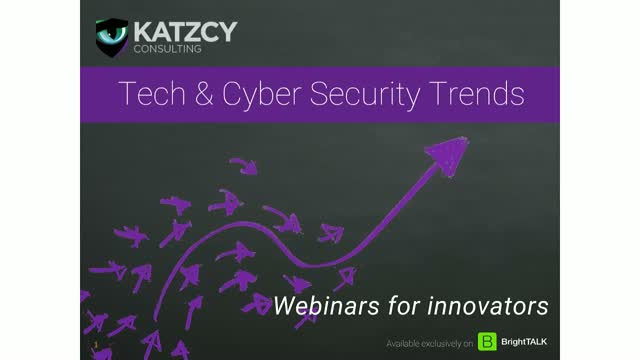 The Tech & Cyber Security Trends channel features experts and executives in and around the high tech, high growth sector to learn about new trends, market changes, and leadership tips. Join our channel.